POSITIVITY is the only thing you can hear in the voice of Bundaberg mum Amanda Ross as she tells the heartbreaking story of how her family was ripped from life as they knew it in just one day. It was supposed to be a February afternoon no different to any other. Mrs Ross picked up her four-year-old son Sam from his swimming lesson - he had started kindergarten three days earlier. As she removed his sun shirt, something caught her eye - purple marks on his back and arms. Confused and alarmed by what she was seeing, Mrs Ross took Sam to her family doctor. The doctor referred her directly to the hospital and soon after the pair flew to the Royal Brisbane Children's Hospital for immediate treatment. Young Sam had leukemia and they weren't going home any time soon. "We had nothing. I lived in my mum's clothes for two days," Mrs Ross said. 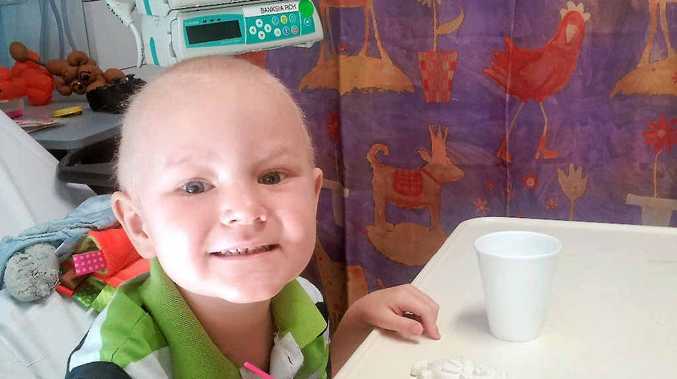 But Sam didn't just have leukaemia, he had a rare substrain, T-cell. "He's number seven in the world to have it," Mrs Ross said. The pair moved into Ronald McDonald House, where they were later joined by Sam's dad Justin. But the facilities couldn't accommodate two-year-old son Ryan, so he remained in Bundaberg for seven weeks with his grandparents. "Not having our little one with us was just horrific," Mrs Ross said. When a larger unit became available through the Leukaemia Foundation, the family was reunited. Mrs Ross had to leave her Year 4 teaching position at Norville State School and become a full-time carer to her sick boy and two-year-old son in Brisbane. Husband Justin was able to get a transfer to Brisbane with his company Kurt's Transport. But with a mortgage still ticking over at home and medical bills rolling in fast, Ms Ross said it wasn't easy living on one wage. To support the Bundaberg family, a charity auction is being held today on Facebook. To take part in the auction or support the family, search Facebook for Sam Ross Fundraising Foundation.